Taken by my friend Carmina Portillo. First off, there’s a song, which you can stream below. Nothing like legendary MCs rapping about zoo animals! This is wonderful for school-aged children, but I love it, too! These events, starting on Saturday and Sunday, April 21 and 22, and continuing weekends from May 5 through June 3, will include artists and performers from a diverse representation of Bronx cultures. Think Sugar Hill Gang, breakdancing, Doo Wop music, and salsa and mambo, too! And there will be Cuban and Puerto Rican food, as well as Italian food from Arthur Avenue. And there are great video teasers for the series. For instance, in this one, Grandmaster Caz talks about how the the Boogiedown borough inspired them. And he says the Bronx Zoo (and the Yankees) are synonymous with the borough! Grandmaster Melle Mel and Scorpio of the Furious Five take the stage April 21, May 12, and May 13. You don’t want to miss it. Learn more. Slapz Photography‘s Yoni Benshlomo recently returned from India with some beautiful photography. See more here. Buy a print at his Etsy shop. Watch a mini-documentary on Slapz Photography’s Yoni Benshlomo here. Sheldon Raymore brought stories and dances from the Cheyenne River Sioux tribe. 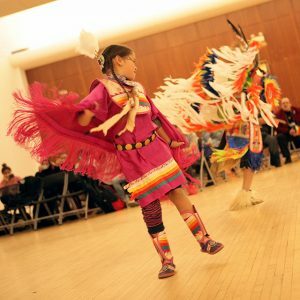 In introducing his dances, his stories, and his regalia to the crowd, Raymore described how each tradition was “gifted” to him. In each introduction, he credited a specific person. After the performance, as he walked across Edwards Parade to have his photo taken, he explained why. 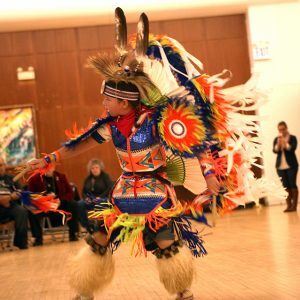 Host and emcee Bobby Gonzalez, a Bronx-based community organizer, said most of the dancers that came to Fordham had volunteered to share their culture. It was in that same spirit that Raymore gifted a story, “How the Crow Became Black,” to all those gathered. A long time ago, Mother Earth’s shawl was covered in snow, so much snow that the animals were freezing. The animals held a grand council to decide [who]should visit the Great Spirit [to ask for help]. Rainbow Crow was the most beautiful of all the winged birds. His feathers had many colors, some not even from this world. Those colors don’t exist anymore. And Rainbow Crow had the most beautiful singing voice out of all the winged birds. And so, Rainbow Crow was chosen. He flew to Great Spirit to ask for the snow to stop. Rainbow Crow flew past Mother Earth, past Grandmother Moon, past Grandfather Sun, finally reaching Great Spirit, Wakan Tanka. To catch the attention of Great Spirit, Rainbow Crow sang the most beautiful songs, and he caught the attention of Creator. But once Creator thinks about something it cannot be unthought—that’s the power of thought. So, he told Rainbow Crow, “I’ll give you this gift of fire.” Creator stuck a torch into the sun and gave it to Rainbow Crow. But being a winged bird, the only way he could carry this gift of fire was in his beak. Rainbow Crow flew back as fast as possible, past Grandfather Sun and Grandmother Moon, finally reaching Mother Earth. When Rainbow Crow put that fire down, all the animals of earth rejoiced. They were dancing and they were excited because life would go on. That was enough for Rainbow Crow. And that is how the crow became black.